GetDivorcePapers.com provides professionally completed, 100% court-approval, money-back guaranteed Mississippi divorce forms. Just create an account, complete the interview, and file for divorce. Our case managers do all the work for you, and send the completed Mississippi divorce forms when they are ready to be filed. At least one partner must be a resident of the state for a minimum of 6 months, and not for the purpose of divorce. 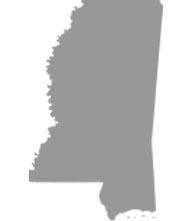 If a member of armed services and spouse are stationed in Mississippi, then they will be considered residents. The divorce is to be filed in the county where either spouse lives. Adultery, including if it leads to pregnancy. Incurable insanity and confinement for a period of three years or more. Knowledgeable desertion for one year or more. Joint custody can be awarded to both parents if they apply for it. Otherwise sole custody may be awarded to any parent, depending on the best interests of the child. However, if there is a history of domestic violence, that parent will not be awarded custody. In some cases, physical custody can be awarded to both parents, while legal custody remains with only one, or vice versa. If the child is of age 12 or older, then preference of the child will be considered first and foremost. Mississippi is a state that holds "titles" at utmost importance. In this scenario, anyone who holds title of the property will be the owner of that property. Though there are no particular legal provisions towards property division, Mississippi adopts an "equitable distribution" clause to handle assets with joint titles. Factors that are taken under consideration include each spouse's contribution towards purchase of property, emotional and market value of the property, values of separate properties, needs of each party, including their liabilities and tax consequences. Income and assets of each spouse. Property owned and property value of each spouse. Standard of living the couple is used to. Duration of the marriage and any marital faults. Any other factors deemed necessary. The child support may be ordered to both parents if both have sustainable incomes and properties. Otherwise the child support may be ordered to any one parent as the court sees fit. Health insurance of the child may be covered in the child support and the courts may require that the parent who is paying child support also put up guarantees or bonds to ensure regular payment. Meditation has no legal provision in the state of Mississippi, it is possible purely voluntarily. There is no need of a lawyer when applying for divorce in the state of Mississippi. A divorce case which is filed without any help of an attorney in any of the states is known as Pro Se Divorce. Literally, Pro Se is a Latin phrase and it means "on her or his own". Process of getting the divorce without the help of lawyer may vary from one State to another. These types of divorces are perfectly legal and enforceable in Mississippi, and are actually very convenient. Usually, once settlements have been made regarding property distribution and custody matters among the spouses in case of a mutual divorce, Pro Se Divorces are filed.